High performance plasticiser admixture. Dosage: 0.3-0.7% over cement weight. To improve the effectiveness of water in concrete. At higher doses, greater reduction of the permeability of the concrete, minimizing the risk of water penetration and increasing its durability. It can be used at higher doses by increasing its water reduction capacity. Particularly effective in improving the compressive strength of mixtures containing both fly ash and slag. Water reduction significantly improves compressive strengths at all ages and increases durability due to the production of low permeability concrete. It allows the workability to increase considerably without adding extra water, maintaining the resistance levels. It allows to reach specific degrees of resistance, reducing the cement content or increasing the workability without reduction in water or cement. Free from chlorides, it is suitable for prestressed and reinforced concrete. Conplast P510 complies with UNE-EN 934-2: 2010 Table 2 as water reducer / plasticizer. Conplast P510 is a chlorine-free water-reducing additive, based on a mixture of lignosulphates and hydrolyzed carbohydrates. It is supplied as a brown solution which disperses in water instantly. Conplast P510 disperses the fine particles of the concrete mixture, thus allowing the water content of the concrete to act more effectively, improving the consistency. This produces higher levels of workability for the same water content, being able to achieve advantages such as water reduction and increased resistance. Optimum dosing of Conplast P510 to achieve specific requirements should be determined by testing using the materials and conditions under which it will be practiced. The usual dose will range from 0.3 to 0.7 liters per 100 kg of cementitious material, including ash, slag or microsilice. Conplast P510 is compatible with other Fosroc Euco additives in the same concrete mix. If more than one additive is used, these must be added to the concrete separately and not mixed together before being added. The resulting properties of the concrete containing more than one additive should be checked by prior testing. 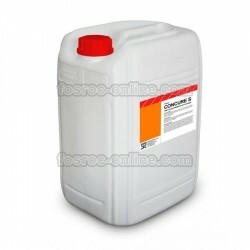 Conplast P510 is suitable for use with all cements complying with standard RC-08. Most water reducing additives cause some delay in the setting of the concrete. This delay may also be affected by factors other than the additive, such as the mixture itself or the conditions under which it is produced. Especially in these cases, tests to check the effects of a particular mixture are recommended. A) Cementitious substitute materials will give higher levels of retardation than those that are experienced with ordinary Portland mixtures at the same additive doses. B) Low temperatures provide higher levels of retardation at the same additive dosages. This is particularly noticeable if cements with additions are used. C) Changes that occur in the type or chemistry of cement, can lead to changes in setting time. The amount of tricalcium aluminate in cement has been identified as one of the main contributing factors in this regard. The greater the amount of tricalcium aluminate, the greater the delay in setting. The correct amount of Conplast P509 should be measured by a suitable doser. To obtain the best results, the additive should be added to the concrete in the kneading water or directly in the mixer at the same time as the water. Contact the Technical Department of Fosroc Euco to be advised on the proper dosing equipment and its installation. An overdose of twice the maximum indicated dose can cause delay of concrete setting as well as an additional air occlusion. As with all structural concrete, good curing should be sought, particularly in situations where overdose has occurred. A curing membrane, water spray or wet burlap should be used. Conplast P510 spills should be absorbed with sand or earth and transferred to appropriate containers. The product residues should be sandblasting with large amounts of water. Disposal of the product and packaging is the responsibility of the end user. Conplast P510 has a storage period of 12 months if kept in a dry place and in its original containers and closed at a temperature of between 2 ° C and 40 ° C.
Freezing point: -3 ° C approx. Conplast P510 should not be swallowed or put into contact with skin and eyes. Wear protective gloves and goggles. Splashes on the skin are removed with water. In case of contact with eyes, remove immediately with plenty of water and seek medical advice. If swallowed, seek medical advice immediately. Do not induce vomiting. For more information consult the Material Safety Data Sheet. Conplast P510 is water based and non-flammable.